Opportunity is full-time, but will consider part-time options. Opportunity is open due to growth/community need. Candidate must be Board Certified or Board Eligible. Physician will practice with current Internal Medicine group, Hancock Internal Medicine. Practice consists of five physicians and two nurse practitioners. Each physician has own clinical staff assigned to them. The practice manager is an RN. Each physician averages 16-20 patients per day in the IM group. This would not be the expectation for the Endocrinologist. Competitive salary and benefits package. Student loan reimbursement, sign on bonus, residency education stipends, and relocation expenses will be considered. Office hours are Monday-Thursday 7:30am to 5:00pm. Candidate must be board certified/board eligible. Teaching opportunity if desired with Marian University and IU students. No call requirements but request open line of communication for curb side consults via phone from others in the employed network. Current EHR is Allscripts in the practice and Meditech in the hospital but transitioning to Cerner in March of 2018. Preference is that the physician lives in the Batesville community. Salary is base plus productivity. Quality bonus. Loan Forgiveness. Sign on Bonus. Malpractice. CME, PTO, Annual Memberships, Licensures etc. Hendricks Regional Health is a 141 bed, non-profit Magnet® hospital in Danville, Indiana, serving western suburban Indianapolis. A medical group of specialty and primary care doctors are located throughout Avon, Brownsburg, Danville, Lizton and Plainfield. A commitment to quality, safety and “Treating People Better” has led to national recognition from a variety of independent health care ratings organizations. At Hendricks Regional Health, community need is the driving force behind who we are and what we do. We strive to help promote health and wellness in our community. That means helping prevent disease, or gain support if it has already struck. Margaret Mary Health is a not-for-profit critical access hospital with off-site facilities and practices located throughout southeastern Indiana. We were recently named a Top 20 Critical Access Hospital by the National Rural Health Association (based on ratings determined by publicly available data including market share, population risk, cost, charge, quality, outcomes,patient perspectives, and financial stability). MMH serves a population of more than 65,000 residents in Ripley, Franklin and surrounding counties and is conveniently located within an hour of both Cincinnati, Ohio and Indianapolis, Indiana. The hospital provides a broad scope of services including 24-hour emergency, family-centered maternity, outpatient rehabilitation, home health, hospice and oncology. Located in the heart of Hendricks County, Danville is a unique blend of small community values with all the conveniences associated with being located just outside Indianapolis. Hendricks is fortunate to have several towns that have a strong sense of community. Families enjoy excellent 4 and 5 star schools, recreation centers, shopping and numerous restaurants. 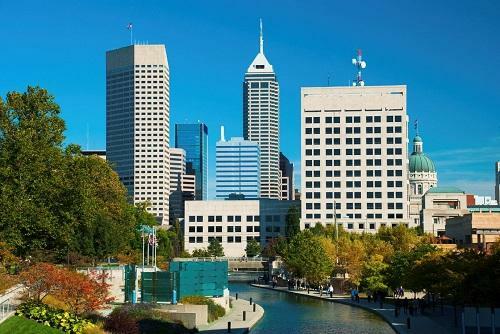 Enjoy the suburban lifestyle while still being less than 30 minutes to downtown Indy’s professional sports, theater and cuisine. In addition, Indianapolis International Airport borders Hendricks county. Batesville is in the heart of southeastern Indiana, within a short drive of numerous metropolitan areas. Located on I-74, it is on the direct path between Cincinnati, Ohio and Indianapolis, Indiana. Batesville is located on the border of Ripley and Franklin counties, an area rich in scenic beauty and Hoosier hospitality. Batesville itself combines the prosperity of economic growth through industry with small-town charm. Founded in 1852, and snuggled in the hills of Southeastern Indiana, it has grown to a community of 6,500 friendly, family-oriented, and forward-thinking citizens. Batesville prides itself on community involvement and the commitment in making the quality of life nothing but the best. While maintaining rural charm, Batesville is fortunate to provide the community with a variety of amenities. Some of these advantages include exceptional public and private school systems, business & industry based companies, top-notch park facilities and world-class healthcare that far surpass what one would expect from a rural community. You are invited to visit and experience world-class charm right in our small city.